The best success stories are founded in humble beginnings; there is something admirable about pursuing a dream and seeing it through. With that comes countless hours of labour, tight budgets, limited manpower—the list might seem inexhaustible, but the end result, as Matt Early puts it, is “very rewarding”. And Matt knows what it’s all about. 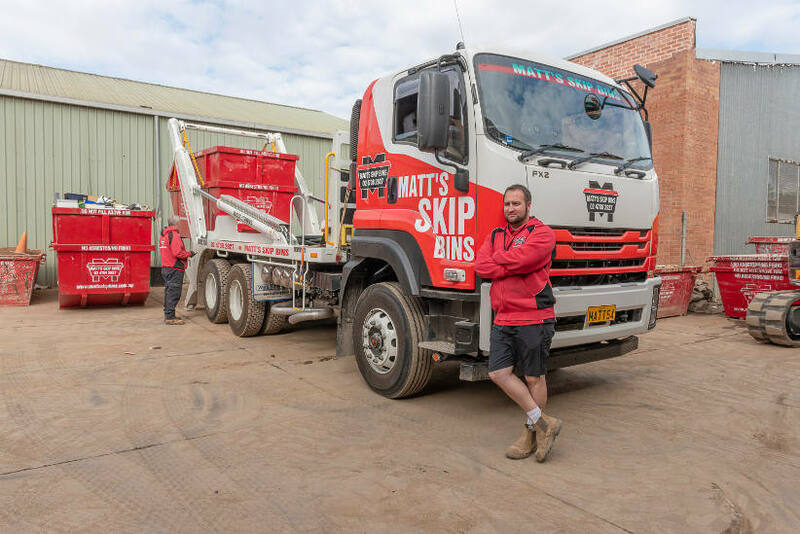 Matt had set out to start his own venture, Matt’s Skip Bins, in 2010—with only a single truck and 11 skip bins in his reserve. Based in Penrith, New South Wales, the company provides services across Sydney’s western suburbs and the neighbouring precincts, and currently possesses multiple trucks with over 160 bins in various sizes, accommodating most waste types. But besides hard work, long hours and the whole nine yards, Matt’s inspiration to start his own venture was bolstered by the desire to work for himself. “I like being my own boss. This way there are no politics and complications to interfere with my work now,” he said with a laugh. And having worked with big names in transport, Matt’s experienced knowledge of the industry came in handy when he started his business. Now in their eighth year, the company has expanded to include a diligent team committed to giving its customers a friendly, reliable experience. Since day one, Matt’s firm belief is that customer satisfaction is the key to success. This forms the foundation of the business and is evident in how the team works twice as hard to provide great service to their customers. “We base everything on our service. There are lot of competitors out there, but we stand out because we provide great service on the phone when customers call, and our drivers are friendly and professional. When we say we’ll turn up, we turn up. And so us being very customer-focused is one thing that sets us apart from others in the business,” he said. And it is this resolute commitment to keep customers happy that has seen the business go from strength to strength—not to mention the outpouring of happy customer testimonials that have cemented his company’s strong credentials. Of course, things weren’t always so smooth. The business had its fair share of challenges, which also defined their growth along the way. Matt recalled a time when heaps of new business came pouring in, but without the needed truck power to meet that. “We started off with smaller trucks, and then as the business grew, there was a greater requirement for larger trucks. But we had to wait before we could start adding bigger trucks,” he said. But that is clearly a thing of the past, what with four sturdy Isuzu trucks to help Matt and his team run the show. With the on-the-go nature of the business demanding long hours on the road, Matt explained that it was important that the trucks they acquired are reliable. “When I needed to purchase my first truck, I did thorough research before buying the Isuzu FRR 600. I decided on it because of its compact size, which allows us to drive into customer’s driveways. “I had heard about Isuzu trucks’ reliability, and now having experienced it firsthand with the FRR 600, I knew I made the right choice”, he explained. And there has been no looking back ever since. Matt subsequently bought the FTR 900 for its higher carrying capacity, and later, the FSR 140 to keep up with the demands of their growing business. “We saw the benefits in adding FSR 140 to our fleet because it has the same width as our FRR 600, which means that we can still access customers’ driveways and other narrow areas. Also, the truck’s high carrying capacity with a compact turning circle makes it a very versatile, reliable vehicle, which is great for our business”, he added. But size isn’t all. In a skip business such as Matt’s, you’d typically be clocking over 800 kilometres every week, which is fatiguing. Thus driver comfort is of paramount importance. “If you’re going to be stuck in a truck all day, you’re going to want to be comfortable, which is what the Isuzu trucks are. And with less downtime and good manoeuvrability with the trucks, our trips have been made easier”, Matt said. For Matt, Isuzu trucks are the gift that keeps on giving. So much so that, he has bought and just received delivery of his latest FXZ 240, a versatile beast with a gross vehicle mass of 24,000 kg, power of 257 kW @ 2,000 rpm and torque of 1,422 Nm @ 1,400 rpm, as well as other advanced features such as coil spring cab suspension and cross locks. With four versatile Isuzu trucks on the road, including the big bogie, Matt is ready to add more happy customers to his growing repute.